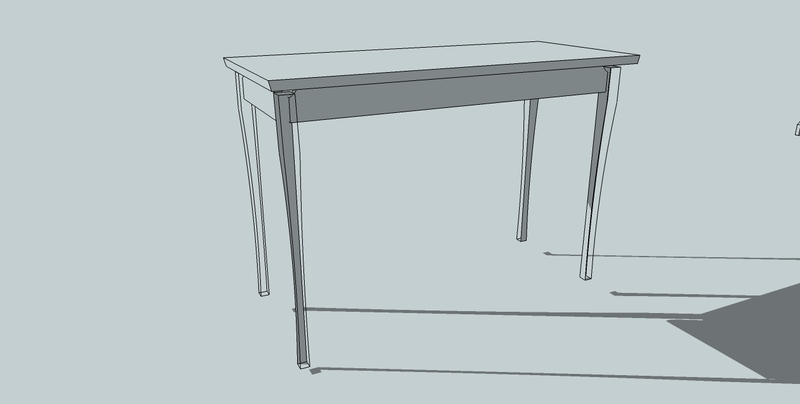 For some time now I have wanted a writing style desk for my downstairs living area that I could tilt up to also use as a small drafting desk. I don’t have enough room downstairs for the full size desk and thought a hybrid of the writing desk and drafting table would be a good alternative. For the basic look I chose a hall table featured in Fine Woodworking. After designing the details I decided to use white oak because….well that is what I had. The first task and I believe the most fun, was laying out and shaping the legs. I decided to put a slight taper and curve on the legs. After making a template it was time to start shaping. I have had a big fascination lately with hand planes and decided to do all of the work with my planes. It turned out to be a great project, I really enjoyed seeing the legs shape up with only the use of my plane irons. I have completed all of the legs and have started putting the frame together, which is coming along nicely. I will post more as I make more progress. Best of luck on your table, Christopher. Nothing beats the feel of a finely tuned plane doing it's job (and nothing is worse than a poor plane ruining your workpiece). Thanks for letting me know about your blog via email. I'll be adding you to my Google reader!